China’s indigenously designed and built Kunlong (Water Dragon) AG600 amphibious aircraft successfully conducted its first water takeoff and landing on the Zhanghe reservoir near Jingmen city in Hubei province on October 20, according to local media reports. 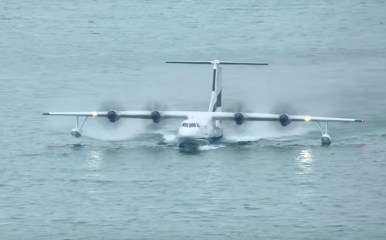 The seaplane’s first waterborne take-off follows the successful completion of high-speed water taxiing trials on the Zhanghe reservoir in early October. Prior to that in August, the AG600 conducted a ground training flight from an airport in the city of Zhuhai in south China’s Guangdong province to an airport in Jingmen, a city in central China’s Hubei province. The aircraft made its maiden flight, which was broadcast live on Chinese television, in December 2017. The AG600, powered by four WJ-6 turboprop engines, is 37 meters long and has a wingspan of 38.8 meters. It can carry 50 people and can stay airborne for up to 12 hours. The plane’s maximum take-off weight is 53.5 tons, its maximum cruising speed 500 kilometers per hour, and the maximum operational range without refueling about 4,500 kilometers, according to AVIC. Assuming, as claimed by the plane’s developers, that the AG600 only requires a water depth of 2.5 meters for landing and take-off, it would be an ideal aircraft to supply some of China’s artificial features in the Spratly Islands given that they are surrounded by shallow waters. According AVIC, the AG600 can make round trips without refueling from the southern island province of Hainan to James Shoal, a disputed small bank in the South China Sea administered by Malaysia but claimed by China as its southernmost territory. Indeed, Xinhua reports that the aircraft “provides support for China’s marine monitoring and safety patrol.” Notably, the military utility of the aircraft, however, has been questioned by a number of senior People’s Liberation Army (PLA) officers since last year. The aircraft is expected to be available for delivery to customers in 2022.